Opposition chief whip Ibrahim Semujju Nganda speaks to journalists after the adjournment. Photo by Vincent Kasozi. KAMPALA–Parliament was forced to adjourn prematurely this afternoon as Members of Parliament chorused their disapproval at the military surrounding parliament. Opposition MPs vociferously declared that no debate was going to take place until the ‘siege’ on Parliament was lifted. With the nationwide political tension over an expected motion on a private members bill to lift presidential age limits reaching boiling point, security personnel deployed heavily and blockaded the parliamentary buildings. The deputy speaker Jacob Oulanyah in his communication to the House stated that the deployment was excessive. “The blockade here I don’t know whether it was necessitated by something but in my opinion it has gone way beyond what it should have been,” he said. The nation has been tense with anticipation as Parliament today expected a motion by Igara West MP Raphael Magyezi seeking leave to present a private members bill intending to amend article 102(b) to remove presidential age limits. The Leader of Opposition in Parliament, Winnie Kiiza, speaking on the floor condemned the heavy police deployment at Parliament and the movement restrictions imposed on Opposition Members of Parliament and leaders. “It’s quite unfortunate and shaming to this country. While recounting her personal experience, she said it was unacceptable for the State to act in such a manner that deprives Ugandans of their freedoms. Several opposition leaders were arrested by the police as they attempted to go about their business this morning, among them the Lord Mayor Erias Lukwago and the DP president Norbert Mao. Leader of Opposition Winnie Kiiza addressing journalists at Parliament. PML photo. 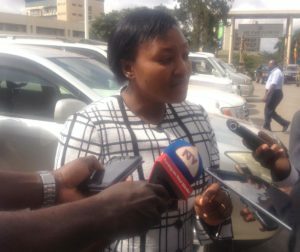 Kiiza also noted that several MPs also had security personnel deployed at their places of residence and prevented from leaving their homes. “This is about the liberty of this country, it’s about the freedom of Ugandans if you cannot move to your workplace,” she lamented. She condemned what she termed as the dehumanisation of MPs and castigated the police for the unnecessary and restrictive security measures that inconvenienced even the Speaker who was not allowed to use the main entrance. She called on the Speaker to adjourn the House until the situation in and around Parliament returns to normal. The Prime Minister Ruhakana Rugunda in his response defended the heavy deployment, saying it was absolutely necessary for the police to ensure preventive measures are taken given the political tension in the country. “As you can see we are all here comfortably…..” he stated before being cut off by boos and protestations from opposition MPs. The Prime Minister was forced to halt his explanation as MPs continued to heckle and boo before they broke out singing the National Anthem. Outside the chambers, several MPs voiced their displeasure at the parliamentary security blockade. “We are surrounded by guns even down in the basement there are commandos with pistols. The whole place is surrounded so we cannot make laws,” Aruu North MP Odonga Otto said. 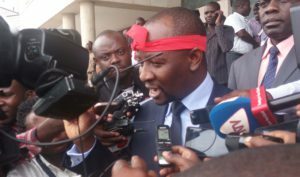 “We cannot debate under gunpoint,” the chief opposition whip Semujju Nganda fumed. The deputy Speaker had earlier announced that the Raphael Magyezi motion on a proposed ‘age limit bill’ will be handled next week. In his communication to the House at the start of the plenary session, he noted that the Speaker had received two notices of a motion regarding the age limit issue but had only seen one of the motions. The second motion is expected to be moved by Kassanda North MP Patrick Nsamba seeking a resolution of Parliament to urge government to form a constitutional review commission. Nsamba’s motion was unanimously rejected by the NRM caucus yesterday as MPs overwhelmingly voted in support of Magyezi’s motion. Oulanyah said the Speaker needed time to scrutinize both motions before they are tabled in Parliament. “At an appropriate time, there will be communication to inform you whether both motions will come or which one of them will come,” he revealed.